Auckland Libraries received an important donation in 2015 when the negatives formerly in the original New Zealand Herald offices, in their historic Albert Street base, were gifted for digitisation. We worked closely with Lauri Tapsell at the Herald. Library staff from Sir George Grey Special Collections and the team of library experts in the wider Heritage Collections, Preservation and Digitisation teams worked together to make the mystery negatives accessible online. The boxes with cryptic labels have been unpacked, cleaned and repackaged in preservation enclosures. They now add up to 16,416 records on our Heritage Images database. 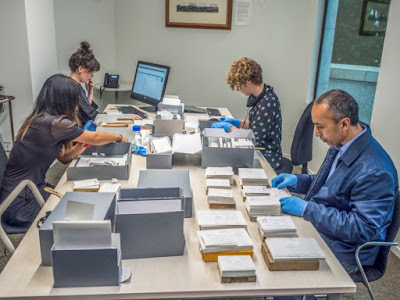 In August 2017, Auckland Libraries will celebrate with New Zealand Micrographic Services the project which has seen the glass plates carefully cleaned and the images digitised. This project has proved to be more than the ‘NZH’ and more than ‘glass plates’. Images from other titles including the Auckland Weekly News were included. And as well as glass plates there were more recent negatives, including fragile acetate. Staff from NZ Micrographic Services on the glass plate cleaning exercise. Working with glass plates is slow and meticulous. Well-fitted nitrile powder-free gloves must be worn when handling photographic negatives and prints. An air blower is used using air to remove any dust from the emulsion, while the non-emulsion side can be brushed and cleaned using accepted conservation techniques. Some items might have graphite re-touching or manually applied diffusing layers on the glass side, so staff must be sure that what they are cleaning off is actually dirt. The New Zealand Herald Glass Plate Negatives collection images have provided a remarkable range of content and the digitisation project has shown the ability to surprise. 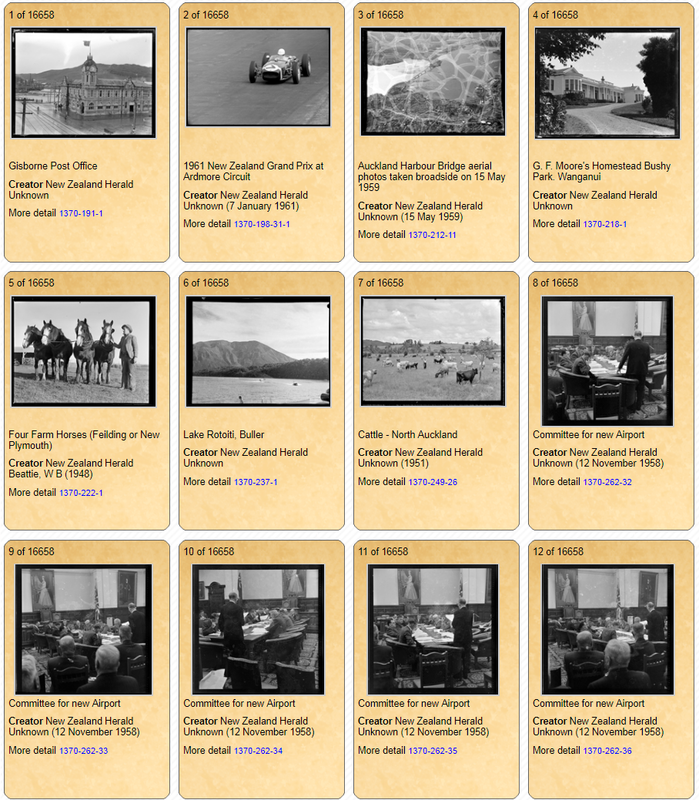 The cleaned and digitised images can now be discovered through our Heritage Images database as well as via DigitalNZ. Heritage social media sites such as Timespanner have featured some of these images. 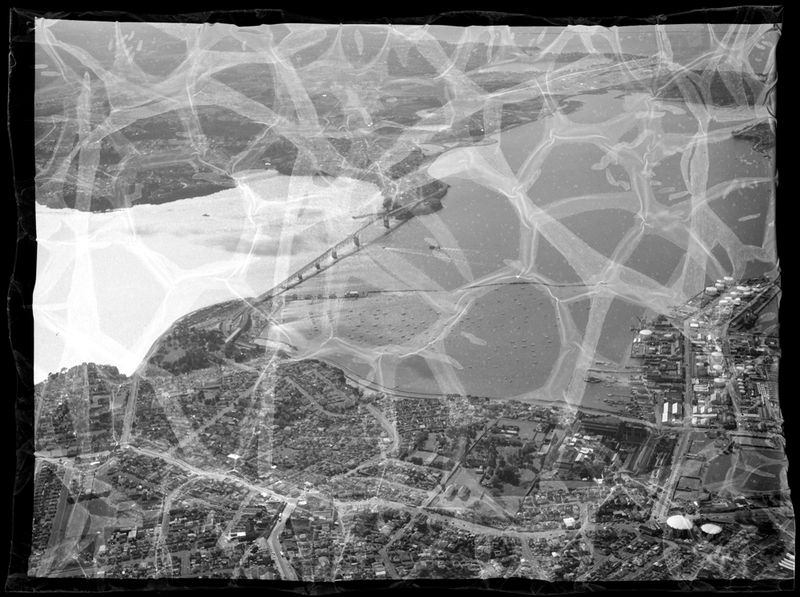 Note the distinctive crazy paving / shattered effect on some of the acetate negatives. Ref: New Zealand Herald. Aerial view of the completed Auckland Harbour Bridge. 15 May 1959. Auckland Libraries,1370-212-11. We have added a reference in our metadata – i.e. our description with the image - to point out this technical condition. In the meantime we are sharing the images – cleaned and digitised - for your enjoyment. 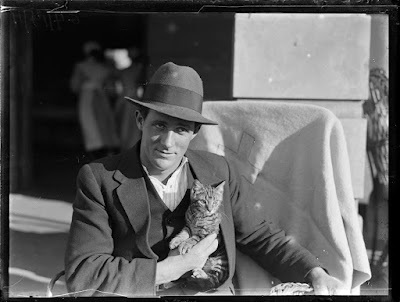 The 'Behind the camera' exhibition - on in the Central City Library until early September - features one of the glass plates from this collection with the image of Seaman Kehoe and the ship’s cat, rescued from the SS Wiltshire when it was wrecked off Great Barrier Island at the end of May 1922. Seaman Kehoe spent time in Auckland Hospital with pneumonia and was later presented with a solid silver tankard (NZH, 27 Jan 1923) for his heroic deeds. You can read the full story in the Herald by visiting Papers Past. 31 May 1922. Auckland Libraries, AWNS-19220615-35-2. This image contrasts with the fine image achieved from the glass plate. This allows for the large format print to be an arresting feature in the exhibition. and the Wiltshire's cat. June 1922. Auckland Libraries, 1370-0568-05. 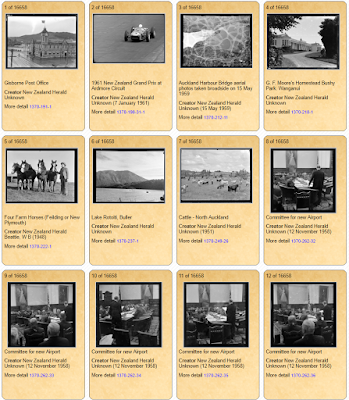 The screenshot below gives an indication of the wide range of places and subjects in the New Zealand Herald Glass Plates Negatives collection – Gisborne, Whanganui, interiors (Committee for the new airport) and outdoors scenes (the 1961 NZ Grand Prix at Ardmore). The aerial view of the new Harbour Bridge takes on a dramatic finish with the distressed acetate appearing cracked and distorted. We are celebrating the team effort that has seen the mysterious boxes with minimal labels become discoverable online. There are many steps to get to this stage, including the metadata, description and subject headings for the image, as well as the caption text from the published image. You can help with adding information on places and people where you can. Just click on the ‘Tell us more’ link. We are grateful to Lauri Tapsell and the New Zealand Herald for building this diverse collection and making it available for us to house and make accessible for the long term. The cleaning, digitisation and descriptions of 16,416 negatives reflects the long term commitment at Auckland Libraries to share New Zealand content. This builds on our partnership with the New Zealand Herald getting the newspaper of record microfilmed and digitised for access via keyword on Papers Past. We are also committed to caring for the hard copy newspaper with safe storage. It is good to celebrate the steps in getting the images out with the team at NZ Micrographic Services who handled each negative. Take a look! What a terrific Blog acknowledging the team effort across multiple organisations (& many decades) Jane, congratulations! Thanks for your message Andy! You're right - it is a true team effort with many different organisations involved. Definitely cause for a celebration! This is a fantastic resource! Thank you to all those involved for making it available. One question - is it possible to search within just the NZH Plate collection in the way you can with the Auckland Weekly News by putting AWNS and the date in the search bar? Hi Jane, thanks for your comment! 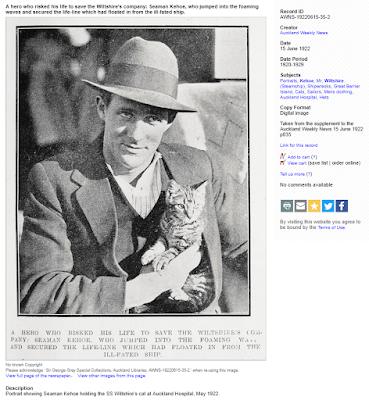 Yes, you can search within the NZ Herald Glass Plate collection, on Heritage Images, by going to the Advanced Search and entering the accession number 1370* in the record ID field. 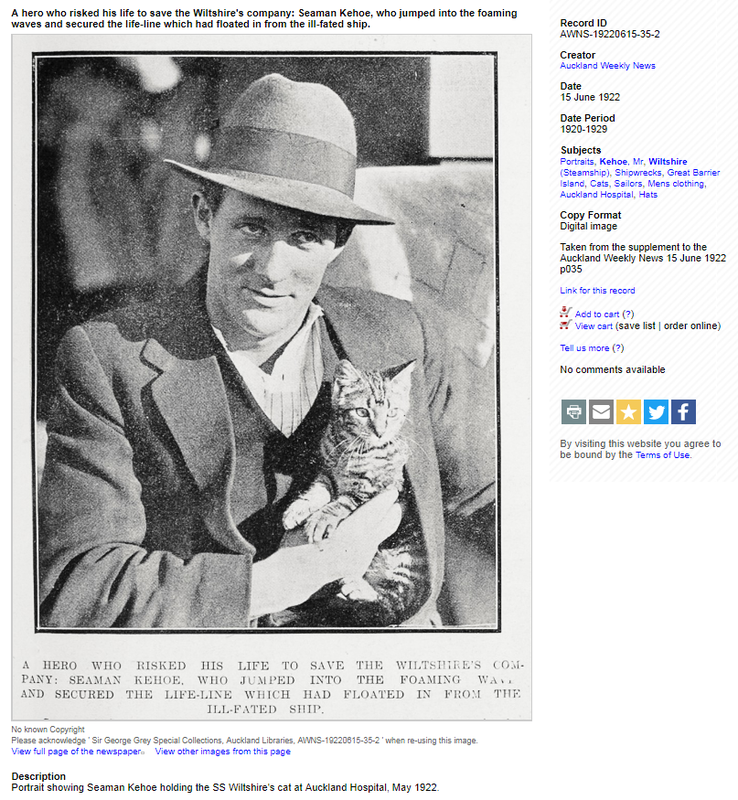 Very little metadata has been added to the NZ Herald records at this stage. The information which has been added is from the one or two word description on the negative box and sometimes a year. You could enter a single keyword in the 'Description' field or add a decade range in the 'Decade' field to limit your search. Thanks, Zoë. What a wonderful resource. Well done NZMS! Thanks for this extra information, Mark. The National Library blog post you shared gives a great overview of the conservation process for treating damaged acetate film negatives. - Zoë. Argh :o) ! You know i'm going to have to look at EVERY one don't you LOL! I'm addicted. It's a wonderful addition for research and bringing back to living memory.